The Mount Forest Curling Club is located at 144 Egremont Street South and with four sheets of ice, a spacious lounge and excellent off-ice viewing area it truly provides a great value for the membership. 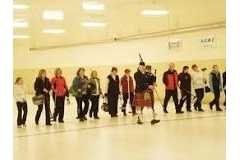 New or inexperienced curlers are welcome any time and every effort is made to make you feel welcome and to provide you with the basic knowledge and skills to participate in this traditional winter sport. Our membership fees are the lowest in the area and our facilities are also available for rental.